The other day, I opened a canned tuna in the kitchen to use it for a dish, and as I expected, my cat woke up and started screaming really loud when he's walking into the kitchen. 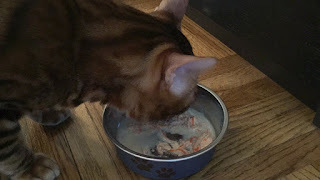 I wasn't planning to give him any treat but it's mean if I hadn't given him any while he could smell the fish, I opened a pouch of Fancy Feast Broths Creamy: With Wild Salmon & Whitefish In A Decadent Creamy Broth. I thought they're julienne carrots when I saw the orange ingredients, but no vegetables were listed in the ingredients. While I was taking this photo, he was hanging on my leg and demanding to give this to him. Like always, he drinks the broth first. When the soup was gone, he was eating the fish. He dropped small and skinny pieces but when I gathered them and fed him by hand, he ate all the fish and the bowl was clean. So far, he's the loudest when I opened this Broths but it's mainly because he's already screaming when he noticed the smell of canned tuna.